This page is all about the town of Denia on the Costa Blanca coast of Spain. It contains useful Denia tourist information for people intending to visit or holiday in Denia. In this tourist guide to the town of Denia on the Costa Blanca in Spain we help visitors who are planning a trip with useful and practical advice on many tourism related subjects such as car hire, accommodation, hotels, hostels, villas to rent, apartments to rent, map, sightseeing, weather, where to go, where to stay, travel information and what to see and do in Denia. To make the best of your visit and holiday we cover everything you need to know about Denia. We also have photos, picture galleries, views, videos and webcams of Denia. Denia is situated north of Javea and is regarded as the very northern part of the Costa Blanca coastline. The sun is said to shine here 320 days a year. Denia and Javea are divided by the Montgo mountain – said to resemble a sleeping elephant. The mountain is certainly spectacular and offers a number of walking routes. Denia is right on the coast and the 20 km of beaches are of very high quality with lots of brightly coloured restaurants and bars by the sea. Denia’s beaches are very wide with great watersports such as windsurfing. Every year the beaches are awarded the European Blue Flag for their water quality and clean fine sand. To the north of Denia there are the fine sand beaches of Les Marines. To the south of Denia the rocky area of Les Rotes with its spectacular coves of transparent waters which are ideal for those who enjoy diving or snorkeling. The town of Denia is large with a real Spanish feel. It’s a working town unlike Javea (for example) which is very much more a tourist town. The main street in Denia has shady plane trees, loads of cafes and designer shops. It’s almost like being in a big city. Denia’s facilities are excellent – a modern hospital, spas, two high quality golf courses in La Sella and Oliva Nova. At night Denia buzzes with nightlife, not necessarily discos but more with the hundreds of bars, live entertainment and restaurants, many of which are right on the sea front. There is charm and atmosphere. If you are looking for a younger more happening place, packed with clubs you would be better off trying Benidorm. Many parts of Denia are quite industrialised, this is not your typical fishing village turned tourist resort however it does appeal to some people because of this. Whereas many other towns empty for the winter with many restaurants and bars shuttered up, Denia hustles and bustles all year round with a good variety of amenities and facilities. Make sure you visit the local market selling fresh fruits and vegetables as well as other locally-made goods and produce – market day in Denia is on a Monday. Another significant landmark in Denia is the old 16th century castle right in the middle of Denia on the hill which gives spectacular views. 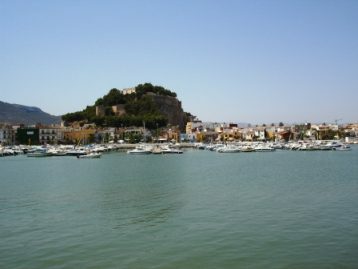 Denia has a large and cosmopolitan port and a large marina. From here you can get to the Baleric islands such as Ibiza. The name Denia came from the Romans, who named the coast Dianum and developed it as an important base on the way to North Africa. Around the 5th century the cathedrals, which were dedicated to Western Gods were removed. Around 713 the followers of Islam took power and re-named it Deniya. In the year 1036 it was recovered by the Spanish and was given the name Taifa de Deniya. When Jaime I seized the city in 1244, he named it Denia. Denia experienced a major upswing in the middle of the 19th century for the manufacturing and processing of raisins. When dealing with raisins was no longer as profitable, Denia turned its focus to tourism, which has been its main industry since the early 1960’s. Denia is close to the A7 motorway and is about midway between Alicante airport and Valencia airport – travel time approx. one hour 15 minutes to each. Getting to Denia is very easy as there are plenty of Denia transfer options such as taxis, shuttle services and buses. Spanish world class golfer Jose Maria Olazabal designed La Sella close to La Jara, Jesus Pobre and Denia. Designed in 1990 it offers a demanding 18 hole golf course and a driving range with over 20 bays. Directions – Leave at exit 62 of the autopista AP-7 and head in direction towards Denia and take a right to La Xara and Jesus Poble. Expensive but well worth the green fee. Four star hotels in Denia are of a very high standard with many facilities available to you such as swimming pools, sauna, Jacuzzi, restaurants, breakfast should be included in the cost, parking, internet access etc. 17 room hotel situated on the outskirts of Denia in a country location. Address: Partida Tossalet, 82 – 03700 Dénia, Spain. Alqueria Ferrando s/n, Jesus Pobre – Denia, 03749 Spain. A really cheap alternative to staying in a Denia hotel is to book into a Denia hostel. Be advised that these hostels are very basic accommodation traditionally sought out by student travelers and backpackers on a budget. Some hostels in Denia will require you to sleep in a room with other guests and share bathrooms. In some cases there will be a strict time that you have to be in by which is no good if you want to sample the Denia nightlife. Needless to say – staying in a Denia hostel is the cheapest form of accommodation you can find in Denia. Good location in the heart of Denia’s old town, meaning you are close to Denia restaurants, shops and the beach. A former nunnery close to Denia’s Moorish castle with 43 renovated rooms. Address: Calle Loreto 12, 03700 Denia, Spain. Address: Calle Manuel Lattur 1, local E, 03700, Denia (Alicante Province). Opening Hours: August Hours: Monday to Sunday from 09:30 to 14:00 and 16:00 to 21:00 h. Summer, from Monday to Sunday (including holidays), from 09:30 to 14:00. and 17:00 to 20:00 h. Winter, from Monday to Saturday, from 09:30 to 13:30 h. and 16:00 to 19:00 on Sundays and public holidays from 09:30 to 13:30 h.
Address: Plaza El Consell S/N, 03700, Dénia. Opening Times: From Friday to Sunday: from 10:00 to 13:00. Puerto de Dénia. Explanada Cervantes S/N. Denia. Opening Hours: Open from July 1 to August 31, Monday to Sunday from 18:30 to 22:00 hours. Vanessa, what are the various ways to get to Denia? Denia is located halfway between Valencia and Alicante airports. By car, it is approximately a one-hour drive to either airport. The main AP7 motorway junction 62 sign posted Denia, Javea and Ondara CV725 takes you into Denia town. This town is very well connected with public transport. What is it about Denia that makes it unique? Built around the historical castle and beautiful buildings with stunning architecture, Denia is indeed a pleasure to walk around. From the castle, the views are spectacular over the marina and up the coastline to Valencia. Shopping: the main high street Marquesa de Campo is lined with London Plane Trees which at every time of year are beautifully maintained. There are an abundance of shops ranging from shoes, handbags, jewellery, gifts, clothes, banks, bars and restaurants. It’s a thriving town with pretty much everything you need. Marina has mooring with beautiful yachts and has the equipment to lift the larger yachts of 70 feet which makes it a perfect place for the sea sportsman or woman. Around the marina is a variety of restaurants and most of them are open all year round. You can charter a yacht and book a fishing trip. From the Port you can take a ferry to take you to Ibiza, Palma de Mallorca and Formentera which are just a few hours away. As a foot passenger it is very cheap. What food and restaurants can you recommend? The main street for food is called Carrer Loreto. Here, you will find a superb selection of restaurants and tapas bars such as the La Seu restaurant which is known for its exquisite food and the Taberna Seville for its tasty tapas. There are of course more restaurants other than the two but these are my favourites. For a good Indian I go to Kathmandu which is just a short walk along the coast road. Excellent value and reasonably priced. When is the best time to go to the market? There are various markets you can find in Denia. The main market is by the portside at the lower part of the main high street. This is on a Friday. At different times of the year, they have the medieval market. The fish market is open daily and it usually begins in the late afternoon. The beaches are all BLUE FLAG which means they are safe to swim in. A variety of water sports in designated sections are also available such as paddle surfing, kite surfing, surfing, kayaking and canoeing. For the beach lover who likes peace and quiet, there are literally kilometres of sand where you can go sunbathing. Any nature reserve in the area? Les Rotes is a nature reserve with no boats allowed and has a variety of marine life to see. Snorkelling and scuba diving are very popular in this section of Denia. This part of the coast is protected including the natural dunes, caves, plants and wildlife. A foot path allows you to walk from Denia marina all the way to the lighthouse which is a few kilometres. The majority of the area is flat and there is wheel chair access. Along this route are some traditional restaurants and bars which makes it a very pleasant place to take a leisurely walk as refreshments can be found along the way. Any parks and flora that you can name of? The backdrop for Denia is this Spectacular Mountain and national park. The Montgo Natural Park declared in 1987, covers an area of 2117.68 hectares and rises to 753 meters. It has witnessed the passage of man from ancient times and has a high cultural and archaeological value. It’s also noted for its more than 650 species of flora among which are endemic such as the Carduncellus dianius. The Montgo reaches the sea at Cape San Antonio, which at its feet is home to the Natural Reserve of the seabed that bears its name. It was declared in 1994 due to its monetary significance and the biodiversity that it contains. When do they celebrate the local fiestas? Fiestas dates vary so please check with the local tourist information Centre. Every month something is happening, from Bull runs in July to burning the faellas in March. Page Summary – This page contains unique content about the beach resort of Denia, a popular tourist destination on the Costa Blanca coast of Spain.